My mum started making these chocolate desserts, having seen them in one of the colour supplements publicising Nigella’s new book Nigellisima. They are so simple and so good that they’ve been in constant rotation from that point onwards. I love them! You can pimp them up, as I have here, and add cocoa nibs or you can keep it simple an just dollop them into pots. For everyday eating I make these in little glass pots but for a proper luxurious dessert I think big, indulgent glasses are the way to go! -Melt the chocolate in a small bowl over a pan of boiling water set aside to cool. – In a large mixing bowl add the cream, the condense milk and the salt. – Use an electric hand mix to whisk the cream and condensed milk mixture to soft peaks. – Take about 1/3 of the cream mixture and add it to the chocolate and mix together really well. – Now take the chocolaty cream and add about 1/3 of it back into the cream mixture and fold it in gently. – Add another 1/3 of the chocolate mixture and fold in. – Then add the final 1/3 and fold until totally combined and smooth but go gently as you don’t want to deflate it too much. – Add the Cointreau and the orange juice and mix into the mousse until it’s nice and glossy. It should be smooth and soft and glossy. – Spoon (or if you like things very neat and tidy you can pipe it) into your serving dishes and sprinkle with the cocoa nibs. – If you want to be even fancier you can butter your glasses first and add 1 tbsp of cocoa nibs to each glass. Swirl the nibs around so that the nibs coat the sides evenly. 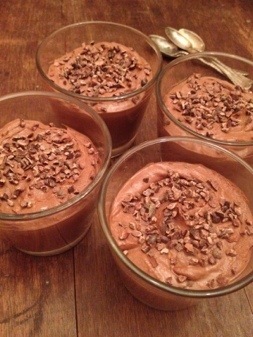 Then pipe the mousse in so that it fills out to the sides properly. – Chill for about 1 hour but technically they’re edible straight away if you really can’t wait! Thanks for this couldn’t find the recipe anywhere after I lost the colour supplement!